Advisory: This post contains some graphic medical photos. Some may not wish to proceed. It was indeed hard to write. 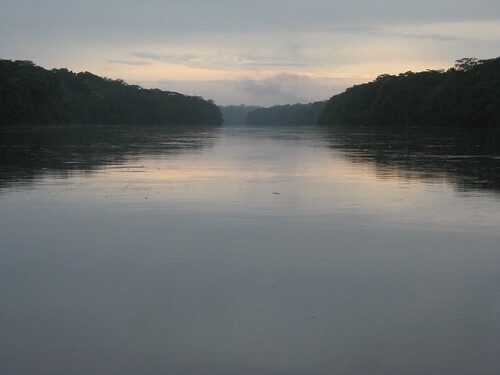 First light of a new day on the Lomami River. 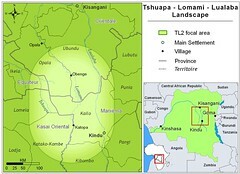 The context : The Lomami is a beautiful river that runs north through the forests of central DR Congo. 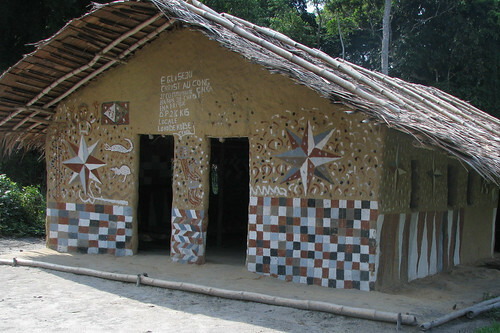 The human population is very low and the tiny villages are usually without the most basic first-aid facilities. The church in Lokobekobe. All decorations from forest “paints”: clay, ashes, the inner bark of a tree and the juice from a fruit. The history of this case : John, our TL2 Scientific Director, visited the small village of Lokobekobe east of the Lomami River in May ’08. A woman, Marie, approached and implored him to come see her father who had a gangrenous leg. Marie had left her own family in Kisangani six months earlier to come visit her father, but finding him unable to tend himself, she stayed, to cultivate his garden and mind his house. John, impressed by her devotion, told Marie to bring her father to Obenge, where he could join the TL2 dugout north to the town of Opala where there were some medical facilities. The old man, Kafilinga, was carried the 40 km (25 mi) along a forest trail, only to arrive at Obenge after our dugout had left. But we had provided Moro, the Obenge nurse, with the penicillin for a massive treatment. Amazingly the leg started to heal. Kafilingi could even stand up. Unfortunately, in November the gangrene erupted again. Moro, the nurse, suspected cancer of the bone. He told John confidentially that the only hope was amputation and recommended his mentor, Jean-Louis, a surgeon who practices about 50 km (31 mi) north west. Kafilinga’s daughter, Marie, always by his side, was distraught as she had no money. Neither did the project have the 400-500 dollars needed to bring Jean Louis to Obenge and pay for his medical interventions. Cleaning Kafilinga’s leg at the Obenge dispensary in November. But there was hope for this case : We could use some of the 900 dollars donated to TL2 by the summer camp where our daughter was a counselor. So we told Moro to arrange to get Jean-Louis to Obenge. The “doctor’s” background : Jean-Louis Yoko’s last two years of high school were medical training to become a nurse. After that he worked as an apprentice to a kindly surgeon in Opala. 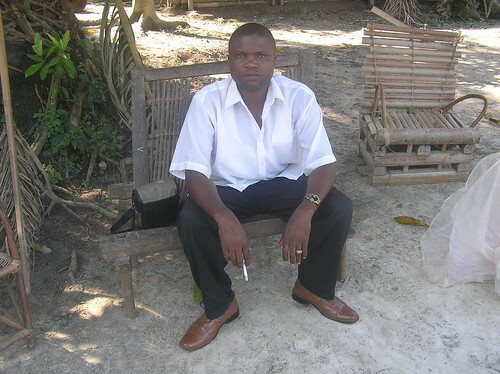 The beloved mentor is dead, but Jean-Louis has been working independently for several years now. Among other interventions he has twice amputated legs, both times successfully. The only way to contact Jean-Louis was to physically go to get him. Moro, the nurse, first took a dug-out down the Lomami then walked 35 km west to the village of Yawende Lolo. Together he and Jean-Louis walked and paddled pack. Altogether about five days. Jean-Louis the nurse-surgeon who came to Obenge to help. The sad outcome : the very night before the doctor arrived in Obenge, Kafilinga died of septicemia. 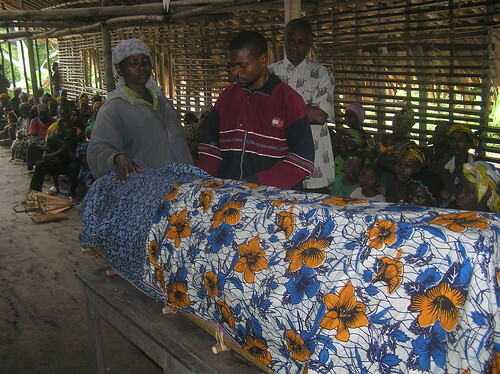 Jean-Louis and Moro docked and walked up to a burial in process. 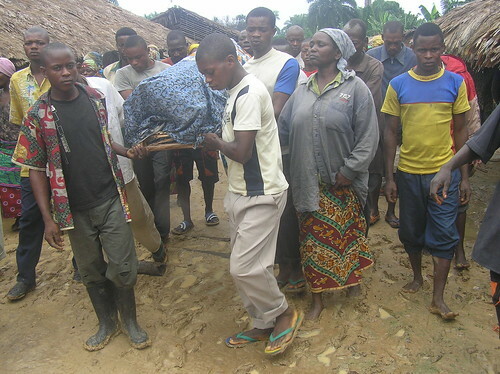 Marie, Kafilinga’s daughter, walked along beside his coffin. The whole village came to the burial. The not-so sad sequel for Obenge: Jean-Louis’s visit has been a life-saver for others. 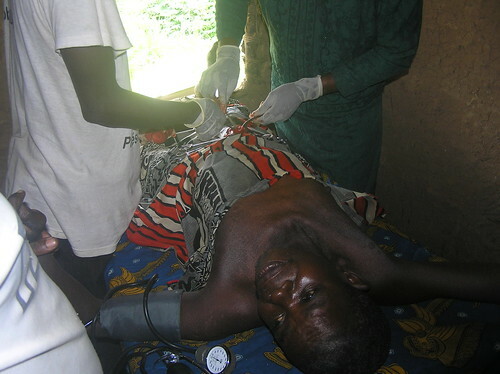 The chronically ill of Obenge and others carried in from near-by villages were all successfully treated. This included ovarian cysts, external hernias of various kinds, and a case of appendicitis. Local anesthesia being used for this hernia operation. Jean-Louis in green, Moro assisting him. This entry was written by Terese Hart, posted on 2008-12-19 at 10:25 am, filed under About the project. Bookmark the permalink. Follow any comments here with the RSS feed for this post. Post a comment or leave a trackback: Trackback URL.